The Privacy Switch extension takes over your web-browser’s default search provider and controls what will be opened to you whenever you do a searching. Other than the search results, it also provides lots of annoying advertisements on the search page. Some of these advertisements developed to trick you into buying some questionable products and software. Moreover, sometimes, those ads could redirect you to misleading or harmful pages. Although, Privacy Switch add-on is not a virus, but it does bad things, and it alters settings of installed web browsers. Moreover, an ‘ad-supported’ software (also known as adware) can be additionally installed on to your personal computer with this addon, which will display a large amount of ads, or even massive full page advertisements that blocks surfing the World Wide Web. Often such these ads may recommend to install other unknown and unwanted software or visit malicious web-pages. We strongly advise that you perform the few simple steps below that will assist you to remove Privacy Switch plugin using the standard features of Windows and some proven free programs. In the step by step tutorial below, we will try to cover the Google Chrome and other web browsers and provide general help to remove Privacy Switch add-on. You may find some minor differences in your Microsoft Windows install. No matter, you should be okay if you follow the steps outlined below: delete all suspicious and unknown applications, reset web browsers settings, fix web browsers shortcuts, use free malicious software removal utilities. Read it once, after doing so, please print this page as you may need to close your browser or restart your personal computer. The following instructions is a step-by-step guide, which will help you manually remove Privacy Switch plugin from the Google Chrome, Internet Explorer, Firefox and Microsoft Edge. 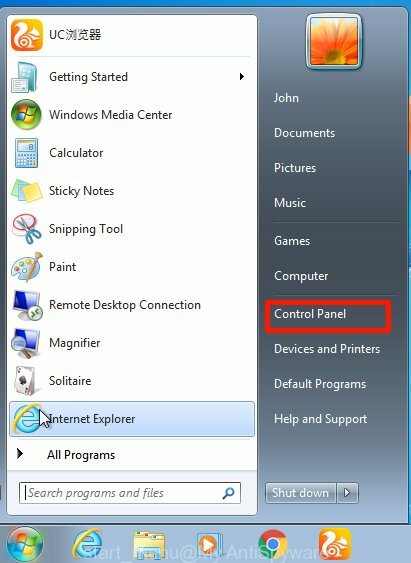 First method for manual addon removal is to go into the Windows “Control Panel”, then “Uninstall a program” console. Take a look at the list of software on your PC and see if there are any suspicious and unknown applications. If you see any, you need to uninstall them. Of course, before doing so, you can do an Net search to find details on the application. If it is a potentially unwanted program, adware or malicious software, you will likely find information that says so. Carefully browse through the list of installed programs and remove all applications that has the name such as “Privacy Switch”. We recommend to click ‘Installed programs’ and even sorts all installed applications by date. 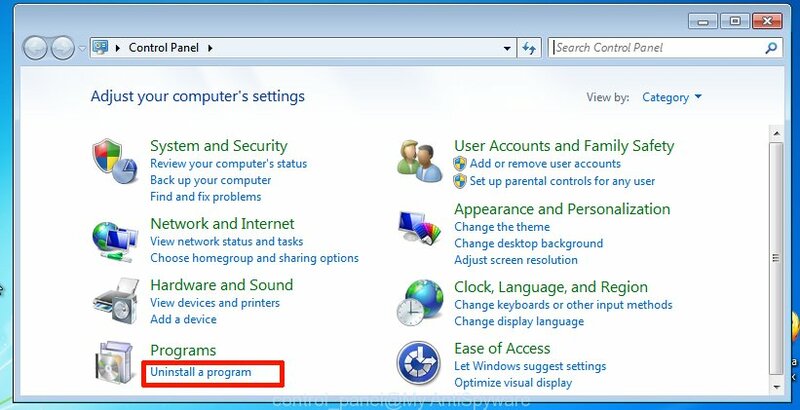 After you have found anything suspicious that may be the extension, ‘ad supported’ software or PUPs, then choose this application and click ‘Uninstall’ in the upper part of the window. If the suspicious application blocked from removal, then use Revo Uninstaller Freeware to fully get rid of it from your computer. 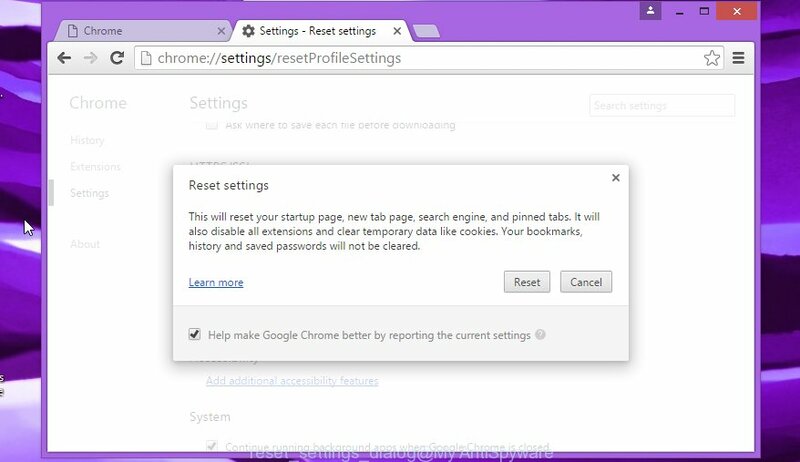 Run the Reset internet browser tool of the Chrome to reset all its settings like start page, new tab and default search engine to original defaults. This is a very useful utility to use, in the case of web-browser unwanted extensions like Privacy Switch. Once this procedure is finished, your internet browser’s start page, new tab and default search engine will be restored to their original defaults. The easiest solution to remove Privacy Switch extension is to use an anti-malware program capable of detecting unwanted add-ons such as Privacy Switch. We recommend try Zemana Free or another free malware remover that listed below. It has excellent detection rate when it comes to adware, addons and other potentially unwanted programs. We suggest using the Zemana Anti Malware (ZAM) which are completely clean your system of the add-on. The utility is an advanced malicious software removal program developed by (c) Zemana lab. It’s able to help you remove PUPs, addons, adware, malware, toolbars, ransomware and other security threats from your machine for free. 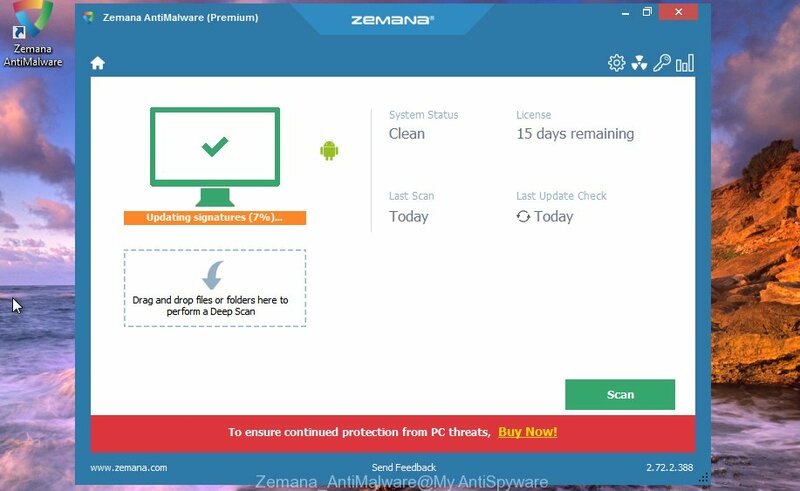 Download Zemana Anti-Malware (ZAM) on your computer from the following link. Once the download is finished, launch it and follow the prompts. Once installed, the Zemana Free will try to update itself and when this procedure is finished, press the “Scan” button . 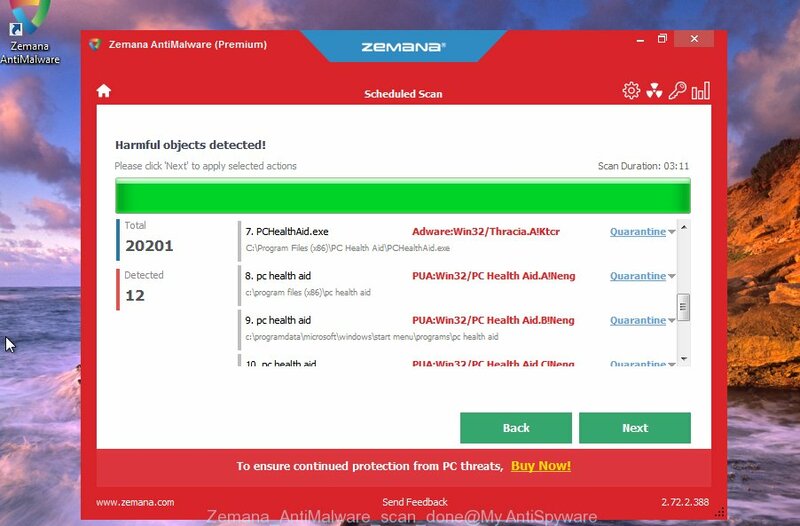 Zemana Free tool will begin scanning the whole PC to find out Privacy Switch addon which designed to redirect your browser to an undesired page. A system scan may take anywhere from 5 to 30 minutes, depending on your system. When you are ready, click “Next” button. The Zemana Anti-Malware (ZAM) will delete Privacy Switch plugin which cause an annoying site to appear and add threats to the Quarantine. You can delete Privacy Switch extension automatically with a help of Malwarebytes Free. 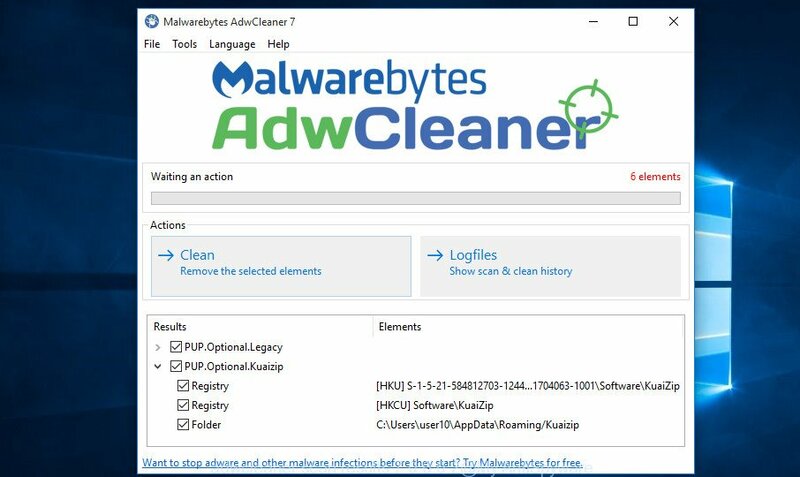 We recommend this free malware removal tool because it can easily get rid of plugins, adware, potentially unwanted applications and toolbars with all their components such as files, folders and registry entries. 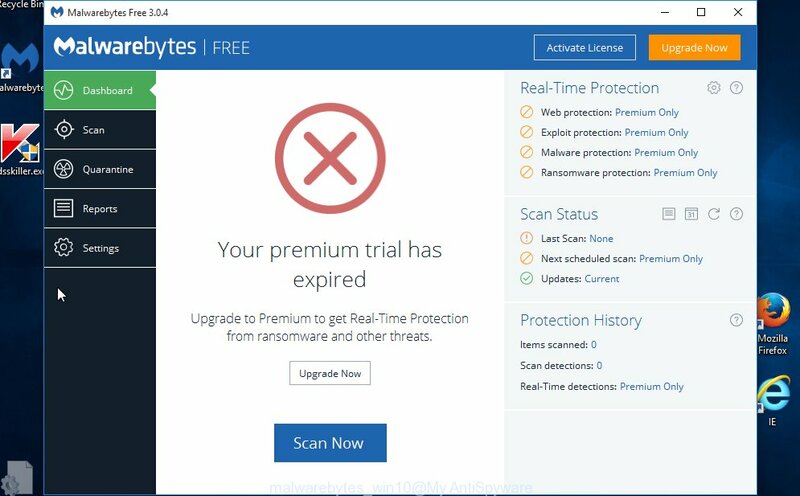 Download MalwareBytes Anti-Malware (MBAM) from the following link and save it directly to your Windows Desktop. After the download is finished, close all windows on your personal computer. Further, open the file named mb3-setup. If the “User Account Control” prompt pops up as displayed on the screen below, click the “Yes” button. It will show the “Setup wizard” which will help you setup MalwareBytes Free on the personal computer. Follow the prompts and do not make any changes to default settings. Once setup is finished successfully, click Finish button. Then MalwareBytes Anti Malware (MBAM) will automatically start and you can see its main window as displayed on the image below. Next, click the “Scan Now” button .MalwareBytes program will scan through the whole PC system for the Privacy Switch add-on related files, folders and registry keys. A system scan can take anywhere from 5 to 30 minutes, depending on your machine. When a threat is found, the number of the security threats will change accordingly. Wait until the the scanning is complete. 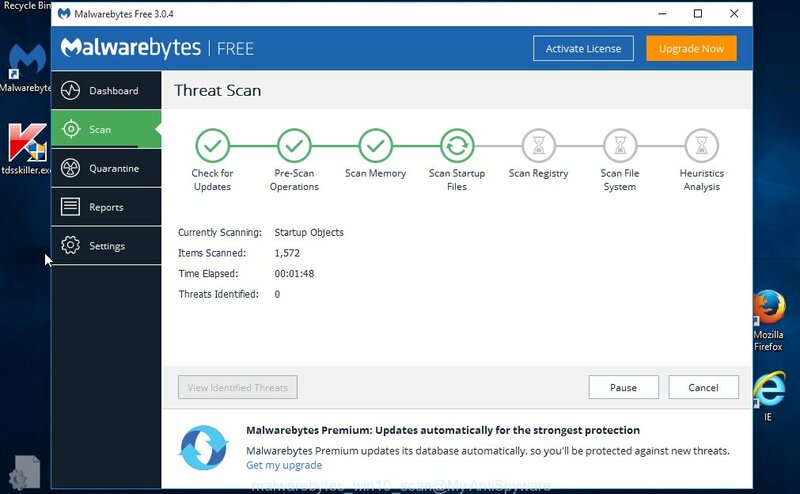 After the scan is finished, MalwareBytes will display you the results. In order to remove all items, simply click “Quarantine Selected” button. 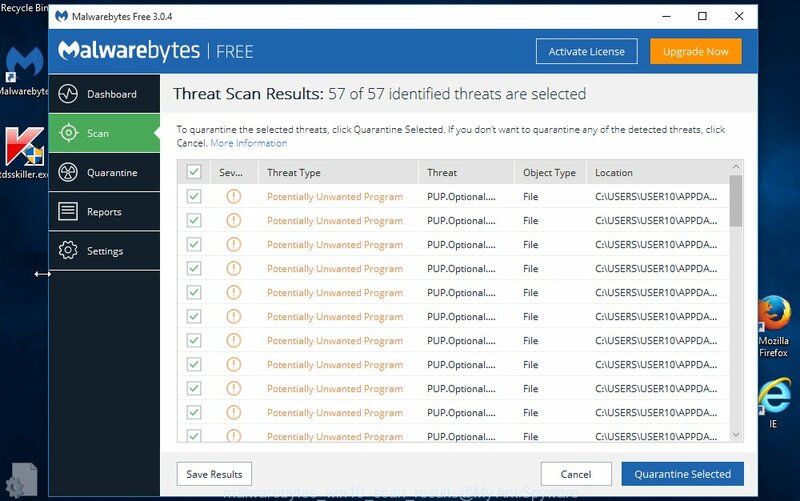 The MalwareBytes Anti Malware (MBAM) will delete Privacy Switch add-on which developed to redirect your internet browser to an intrusive page and add threats to the Quarantine. After disinfection is done, you may be prompted to reboot your personal computer. We advise you look at the following video, which completely explains the procedure of using the MalwareBytes Anti Malware (MBAM) to get rid of hijackers, ad-supported software and other malicious software. The AdwCleaner utility is free and easy to use. 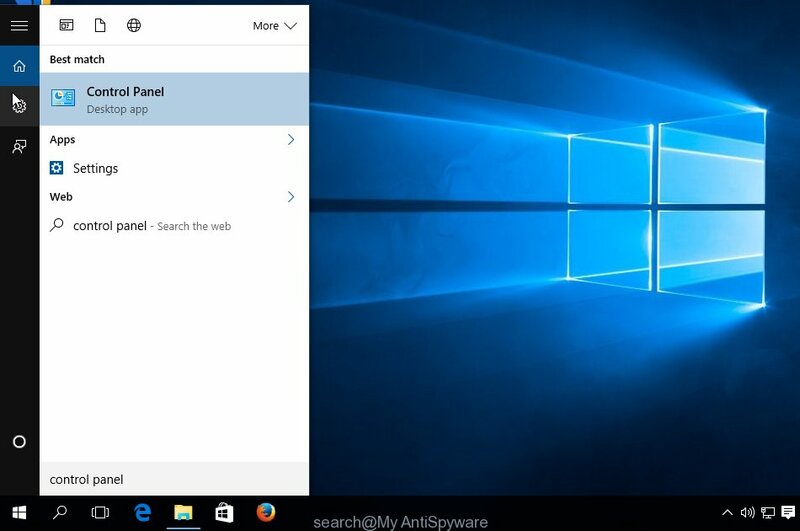 It can scan and remove Privacy Switch extension and other kinds of potential threats such as malicious software and adware, malware, PUPs and ad supported software from system (Windows 10, 8, 7, XP) and thereby revert back internet browsers default settings (new tab page, home page and search provider by default). AdwCleaner is powerful enough to find and get rid of malicious registry entries and files that are hidden on the computer. Further, click “Scan” button for checking your PC for the Privacy Switch plugin related files, folders and registry keys. A system scan can take anywhere from 5 to 30 minutes, depending on your machine. Once AdwCleaner has finished scanning your computer, AdwCleaner will open a list of found threats like below. Make sure all items have ‘checkmark’ and press “Clean” button. It will display a prompt as shown below. You need to click “OK”. When disinfection is done, the AdwCleaner may ask you to restart your PC system. When your PC is started, you will see an AdwCleaner log. It is important to use ad blocker programs such as AdGuard to protect your computer from malicious web-pages. Most security experts says that it’s okay to block advertisements. You should do so just to stay safe! And, of course, the AdGuard may to stop Privacy Switch redirect and other annoying pages. 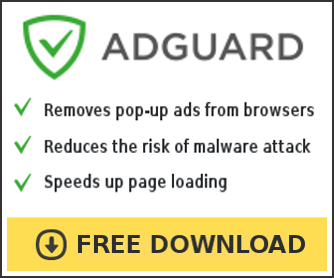 Download AdGuard program on your MS Windows Desktop by clicking on the following link. Once the installation is finished, click “Skip” to close the setup application and use the default settings, or click “Get Started” to see an quick tutorial which will help you get to know AdGuard better. In most cases, the default settings are enough and you do not need to change anything. Each time, when you run your PC system, AdGuard will start automatically and stop pop-ups, Privacy Switch redirect, as well as other harmful or misleading web-sites. For an overview of all the features of the program, or to change its settings you can simply double-click on the icon named AdGuard, that can be found on your desktop. Now your system should be free of the Privacy Switch plugin and other malware and ad-supported software. Uninstall AdwCleaner. We suggest that you keep AdGuard (to help you stop unwanted pop-up advertisements and intrusive malicious web pages) and Zemana Free (to periodically scan your personal computer for new extensions and other malicious software). Probably you are running an older version of Java or Adobe Flash Player. This can be a security risk, so download and install the latest version right now. If you are still having problems while trying to delete Privacy Switch extension from the Chrome and other internet browsers, then ask for help in our Spyware/Malware removal forum.